1. Population: With over 1.2 billion people, India is second only to China and will likely overtake China if current growth continues. 2. Land size: In order to accommodate the huge population, India does have the seventh largest land area in the world. 3. One quarter of the work force: It’s estimated that in the next two to three years, 25% of people entering the workforce will be Indian. 4. Millions: There are over a million Indian millionaires. However, the gap between the rich and poor is still very big, with many living on a poverty level. 5. Language: India has no National Language. Hindi is an official language used in many regions, English is also commonly used in many regions. There are many popular regional languages like Tamil, Malayalam, Telugu, Kannada and Marathi spoken and officially used in their respective regions. 6. Value of PI: Baudhayana, an Indian mathematician first calculated the value of PI. He is also said to have discovered other mathematical theorems still in use. 7. University: The first university is said to have been started in Takshila in 700 B.C. Thousands of students from all over the world studied a variety of subjects. 8. Largest postal system: India still uses the postal system and it shows. They still have the largest postal system in the world. 9. Trains: India has the world’s second largest train network, and it is the largest civilian employer. 10. Varanasi: Having been visited by Buddha in 500 B.C. Varanasi is the oldest continuously habituated city in the world. 11. Wonder: The Taj Mahal is considered one of the Seven Wonders of the World. It was built by Mughal Emperor Shah Jahan in memory of his wife. 12. Food: Cooking and eating are a large part of Indian culture and tradition. It’s not uncommon for meals to require hours of preparation time and most festivals and gatherings center around food. 13. Roads: The world’s largest road network is in India—over 1.9 million miles of roads cover the country. 14. Chess: Chaturanga—Sanskrit, meaning “four members of an army” was invented in India. Now known all over the world, chess had its beginnings in India. 15. 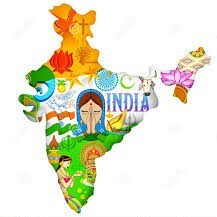 Name: The official Sanskrit name for India is Bharat Ganarajya. Even today, it is often called Bharat by young and old. 16. Origin of India name: The name “India” comes from the Indus River, which is where earliest settlers made their homes. The Indus valley is one of the world’s earliest urban civilizations. 17. British rule: The British ruled India from 1858-1947, although their presence and trade had been going on for some time before then. 18. Independence: On August 15, 1947, India gained independence from the British, after a successful nearly non-violent independence movement. 19. Government: India is governed under a parliamentary system and is a federal constitutional republic. There are 28 states and 7 union territories in India. 20. Capital: The capital city of India is New Delhi. It is the center of government and is also home to 2 UNESCO heritage sites. 21. Diamonds: Until 1986, the only place where diamonds had been officially found was in India. 22. Multi-lingual: There are 1,652 dialects and languages spoken in India. It is not at all unusual for an Indian to speak at least two and often more languages well. 23. Recognized languages: There are currently 22 recognized languages in India, with Standard Hindi and English being the standard languages. 24. English speakers: Because so many Indians speak English, India now has the largest population of English speakers in the world. 25. Borders: India shares land borders with Pakistan, China, Nepal, Bhutan, Burma and Bangladesh. Sri Lanka and the Maldives are neighboring ocean countries. 26. Exports: Going back thousands of years, India has long exported textiles. Current exports include steel, agricultural goods, and many services, such as in the tech or medical industries. 27. Beauties: India has won two Miss Universe and five Miss World titles so far. Many Indian beauty queens are also Bollywood actresses or models. 28. Age demographic: More than 50% of India is younger than 25 and more than 65% are 35 or younger. The average Indian age is much younger than most other nations. 29. Old civilization: Some of the oldest and most long-lasting civilizations can be traced to India, or areas that used to belong to India. Early empires were larger than other neighboring empires of the time, including Egypt and Mesopotamia. 30. Peace loving: India has never invaded any country. It was invaded by other countries and rulers, including Alexander the Great. 31. Movies: No list featuring facts about India would be complete without this tidbit: India has the largest movie industry in the world. Most Indian movies come from Bollywood, but there are many studios around the country who contribute as well. 32. Holy Writings: The Vedic Scriptures date to 2000-500 BC and were composed in the Punjab region. 33. Invented zero: A commonly known, but not to be neglected India fact is that the number and concept of zero was invented and documented first by Indians. 34. Ancient buildings: All over India, ancient buildings and structures can be found. Sculptures and paintings on the buildings often tell stories or describe life at that time period. 35. IT: The Pentium chip and Hotmail were created by Indians—Vinod Dahm and Sabeer Bhatia respectively. The Indian IT population is growing and is highly sought after all over the world. 36. School: The world’s largest Montessori school is in India. It has over 26,000 students! 37. National fruit: While India may not be the biggest mango exporter, over 12 million tons of mangoes are grown each year. That’s the equivalent of over 2,400 Asian Elephants! 38. Cotton: Indian cotton was well known; some of the earliest cotton came from India. Roman and Mongol royalty wore Indian cotton, known for being light and airy. 39. Beans: India produces more dried beans than any other nation on earth. This includes a variety of legumes such as the kidney bean and chick peas as well as a variety of lentils. 40. Bananas: Another top export from India is bananas. No other country exports as many bananas, not even Brazil, which is second. 41. Producer of milk: Because India’s pastoral community is heavily dependent on milk, India has become the largest producer of milk in the world. 42. National drink: Chai, or tea is drunk widely in India. They produce more tea than any other country, exporting to countries all over the world. 43. Spices: While Saffron has its roots in neighboring countries, India uses the most expensive spice in several sweets and other dishes. 44. Staples: The main food staples in India are rice in the south, wheat in the north, and dhal or lentils. 45. Lucky color: Red is the color of good luck and is usually worn for weddings and other celebrations and festivals. 46. Vegetarian: India has the largest amount of vegetarians in the world. 47. Finger food: Most Indian food is still traditionally eaten without silverware. Rotis or chapattis aid with this. 48. Time: All of India — despite the large land-space is on one time zone. This is, however, half-an-hour different to neighboring countries, making for a complicated time zone. 49. Cherrapunji is the wettest spot on earth. It receives at least 425 inches of rain every year, which is over 5 times more than the tropical rain forests of South America! 50. Highest peaks: The Himalaya includes the highest peak in the world—Everest. The mountain range stretches about 1,500 miles long and is over 23,600 ft at its highest. 51. Sacred River: The Ganga is the longest river in India and is considered sacred by Hindus. It has the most populated river basin in the world. 52. Coastline: The actual coastline on the main land is 3,400 miles, but if you include the islands that belong to India, the coastline is closer to 4,700 miles. 53. Mangrove: The Sundarbans is the largest single block of tidal halophytic mangroves in the world. 1/3 of the Sundarbans is in India. This is also the reserve for the Bengal Tiger. 54. Jungle: Less than 12% of the Indian landmass is covered in jungle. However, the country has a large variety of plant and animal life including 13.7% of all avian creatures. 55. Protected: India has worked hard to preserve endangered species and their shrinking wild-life. There are more than 500 wildlife sanctuaries and 13 reserves. 56. Heritage: There are 27 UNESCO heritage sites in India. These protected areas help to protect the long culture and history of the country. 57. Diversity: India has a lot of geographical diversity, including sand beaches, mountain ranges, desert, rock beaches, and large planes. 58. Climate: The four main climate groups in India are: tropical wet, tropical dry, subtropical humid, and mountain. The four seasons are: winter, summer, monsoon, and post monsoon. 59. Vishnu Temple: This temple in Tirupathi is the most visited pilgrimage destination in the world, even more than Mecca or the Vatican. 60. Lotus Temple: Made from white marble, this temple has 27 free-standing “petals”. The structure is widely recognized for its artistic value as well as a Baha’i place of worship. 61. Humayun’s tomb: A little known fact about India is that the first garden-tomb in the world was built in India. It was built as a tomb for Emperor Humayun, but also houses the graves of his wife and other Mughals. 62. Religious gathering: Every twelve years, the Maha Kumbh Mela happens in Allahabad. This is the largest religious gathering in the world. 63. Brihadeeswara Temple: India’s largest temple which houses the statue of Nandi—carved out of a single 13ft rock. The entire temple is made out of granite and is over 1000 years old. 64. High ground: The world’s highest cricket ground is in Himachal Pradesh. It was built after a hill was leveled at over 2,400 meter above sea level. 65. Largest democracy: India is a democracy and has one of the highest voter turn-outs in the world. Election expenses grow from election to election as well. 66. Flag with meaning: The Indian flag is ‘tri colored’. Saffron—courage and sacrifice; white—truth, peace, and purity; green—prosperity. The Ashok Chakra—righteousness. 67. National Emblem: The Sarnath Lion depicts four lions back to back from which the national emblem stems. It symbolizes courage, confidence, and strength. 68. National animal: The national animal is the Bengal Tiger. Nearly extinct, it enjoys a national reserve where it is protected. 69. National bird: The peacock is the national bird of India and can be seen in many parks, even in the cities. 70. Ganges River Dolphin: Another little known fact about India is this species of dolphin, which includes 2 subspecies and is the only blind dolphin in the world. Both subspecies are in danger of extinction and as such are protected. 71. National flower: The beautiful and fragile lotus is the national flower of India. It’s very common in many bodies of water. 72. National tree: The national tree of India is the bunyan or fig tree. It’s featured in many stories and legends. 73. Gold: India is still the largest buyer of gold in the world. Gold is an important part of Indian culture, including gifts for weddings and other major events or festivals. 74. Largest city: Mumbai is the largest city in India, with over 15 million people. 75. Melting pot: India is home to every major religion in the world. Hinduism, Buddhism, Jainism, and Sikhism all started in India. 76. Hindus: The majority of Indians are Hindus. Most of the religious festivals and holidays are Hindu. 77. Mosques: Home to more mosques than any other country in the world; India has a large Islamic population, the second largest in the country. 78. Cows: The cow is considered a sacred animal and is allowed to roam free in most cities and villages. They often wear a tilak as a symbol of good fortune. 79. Snakes and Ladders: The game of Snakes and Ladders also originated in India, with the lesson being of virtue vs. vices. 80. Music: As diverse as the country itself, music is an integral part of Indian culture, along with dance. There are dozens of local dances, music styles, and theater throughout the country. 81. Cricket: Although the English brought cricket to India, it is still the most popular game in the country. Games are played in parks and official games are watched and cheered by many. 82. National game: The national game of India is field hockey, India has won several gold medals over the years. 83. Mathematics: Indians made noteworthy contributions to trigonometry, calculus, and algebra. In 100 B.C. the decimal system was invented here. 84. Navigation: The word navigation comes from a Sanskrit word as the first navigators made their way along the Sindh River about 6000 years ago. 85. Medical advances: Surgeries were done in India over 2,600 years ago by Sushruta. He also developed Ayurveda and made records of several complicated surgeries and operations. 86. Big business: Vinod Khosla co-founded Sun Microsystems and Rajiv Gupta is the GM of Hewlett-Packard. Many other big international companies are founded or run by or with Indians. 87. Outsourcing: Half of the outsourced IT services in the world come from India. This is a large industry and big part of the current Indian economy. 88. Software: One of the largest exporters of software, India exports to over 60 countries right now. 89. White: Tradition in India holds that white be worn for funerals, in contrast to other countries, where black is more common. 90. Family: The extended family is an important part of Indian life and culture. Many families still live together in extended or ‘joined’ family units. 91. Festivals: Most Indian festivals are religious in origin. The most popular and widely known are Diwali, Holi, Durga Puja, and Ganesh Chaturthi. Festivities can go on for days. 92. Diwali: The festival of lights is celebrated for five days and includes a variety of festivities and traditions, usually done at home with family. Firecrackers and lights are a big part of this festival. 93. Holi: The festival of colors is a bright and colorful festival where playing with colors and water is enjoyed with home-made sweets. 94. Durga Puja: This five day festival is celebrated mostly in the eastern states, though it is celebrated in one form or other all over the country. 95. Ganesh Chaturthi: During the ten-day festival, Hindus remember the Lord Ganesh with decorations, prayers, and celebrations. 96. Rakhi: On this festival, sisters tie a rakhi or holy thread—often a colorful band—on their brother’s wrist while the brothers vow to look after their sisters while presenting them with gifts. 97. Yoga: One of the more known India facts is yoga. Originating in India, yoga is now a world-wide form of exercise and relaxation. Meditation and stretches are an integral part of yoga. 98. Martial arts: Many martial arts have their origins in India. There were said to have been spread throughout Asia by traveling monks. 99. Raziya Sultana: The only woman ruler of both the Mughal period and Sultanate. She dressed as a man and was an efficient and qualified ruler. 100. Dress: Most Indian women prefer ethnic dress, most commonly the sari or salwar kameez. However, for festivals and other events, there are other dresses, some specific for certain occasions. 101. Men’s wear: Men in general wear western clothing, though they often don ethnic wear for festivals, holidays, and occasions. In rural areas, local dress is more common.